These songs are made from the words of spiritual poets like Rumi, Guru Nanak and Shri Ramakrishna. Texts that open the heart for the mystery and magic of life. Klas' voice and music is very naked and comes very close. Swedish musician and yoga teacher Klas Landahl has put music and tunes to words from spiritual poets and teachers like Rumi, Guru Nanak and Shri Ramakrishna. The songs on this CD is a soft and heartful journey that makes life seem more beautiful and magical. "I have chosen texts that open my own heart, that help me feel the depth of life. Texts that make me feel that everything in life is taken care of, everything is fine, everything is beautiful and complete just the way it is. Everything is in order, the pleasurable and the painful things. These songs has been like a contemplation for me, a meditation into trust and surrender". On the CD, Klas sings and plays guitar, bass and melodika. Agnes Magnusson plays cello. The depth of the lyrics is carried by the simple and beautiful arrangements and comes very close. Klas often plays these songs in front of audiences lying down, cradling them into their own heart, into relaxation and healing. "I don't have any agenda how the songs or my performance shall be received, but it's nice to see when it helps people to let go of struggling and just relax for a bit. To just be with the music and themselves, fully absorbed in the present moment. This is really needed in the world of today – a moment of deep rest." 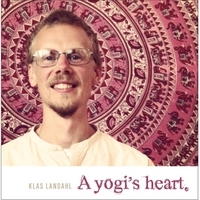 Klas Landahl lives in Stockholme where he runs Stockholm Kundaliniyoga Center. He gives weekly classes, workshops, retreats and music events where people meet to sing together. "How wonderful it is. Your voice is fantastic. Your songs are very touching, deep, and I love your musical arrangements. They are surprisingly original and flow with the words in a powerful way. Bravo! Good work. Best wishes and all blessings to you for a very authentic and deep work. I would love to do the same." "Super, supernice record Klas! Now I've really taken it in. Your voice melts with the texts and music, thank you for this gift and that you are you!" "It was a really calming and opening concert, just what my body and heart wished for. Thank you Klas!"